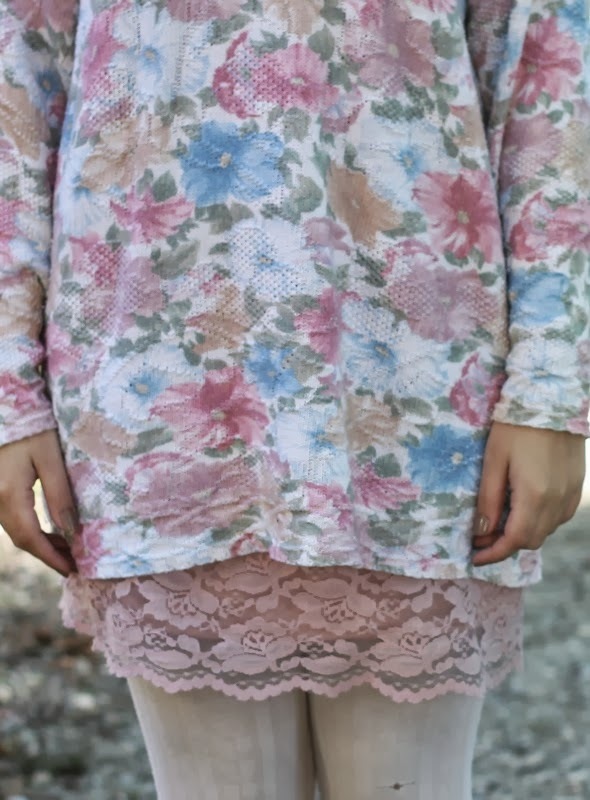 Floral Sweater, Pink Lace Skirt: Thrifted. 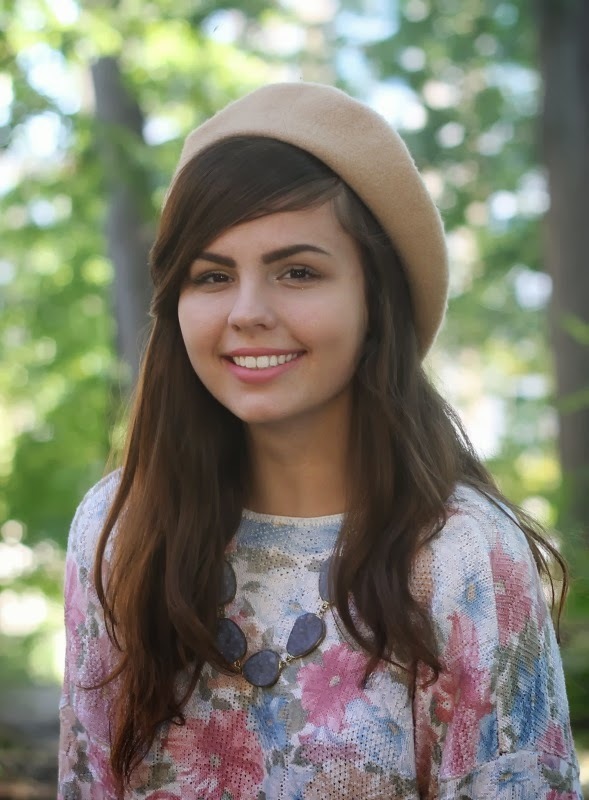 Camel Colored Beret: American Apparel. Although it's Thursday, it's technically a Friday for me since I have no classes tomorrow! It's pretty late though so instead of forming coherent sentences, bullet points of things happening in my life will have to suffice (people like lists better though don't they?). ♥ This is literally the funniest video I've ever seen. I know I'm guilty of it sometimes, but I am nothing like most girls out there and their 'fall craze.' The over saturation of it this year has been driving me insane. This video sums up everything hilariously cynical. ♥ While on that note, I don't get the hype about Starbuck's Pumpkin Spice Lattes? I don't find them that great. I had one from Mcdonald''s last weekend and have been getting them at the campus coffee shop, Jazzman's, and both have been 10 times better. Just me? (Probably). ♥ I signed up to go to NAVS fall conference today! It will be next weekend and I'll be gone the entire time. I am very excited because it is where I gave my life to Christ last year! ♥ Ordered MAC's Rebel a few days ago and just got a notification that it's in my mail box...I am dying you guys. Can't wait to finally have it in my greedy, lipstick loving hands. ♥ In my college writing class we're writing our own obituaries? Creepy but very interesting at the same time. My teacher summed it up well-- "you're not writing about your death, you're writing about your life." ♥ Adored Kaeleah's post to the moon and back. ♥ These coming weeks are going to be rough ones for me with Midterms coming up. It's been really difficult for me to juggle everything this semester--blog wise, email wise (especially), along with school, friends, and sleep. Not quite sure what I'm doing wrong. It's been a struggle to keep up with it all lately so I apologize! ♥ Anddddd I'm obsessed with this app on my phone called Bakery Story. It's basically a game where you create your own bakery and serve food...so yeah, mega nerdy of me. When I baby sat this summer the girls got me hooked and now I can't stop. If you play it too, comment your user name so I can find you! Beware if you don't already play--it's addicting. I love your look!! As always :) And I especially love the lace peeking out of that floral top! I hope you've bounced back and are doing well! How go the travel-to-Italy plans for next year? I think this is my favorite outfit of yours since I started following you. Maybe just because it looks insanely comfortable! PSL syrup is awesome. I will brook no argument on that. But the secret is one or two pumps of it in your coffee. The actual lattes Starbucks sell are way too sweet for me - but halving the syrup or just having a little of it in coffee with a lot of cream is amazing. 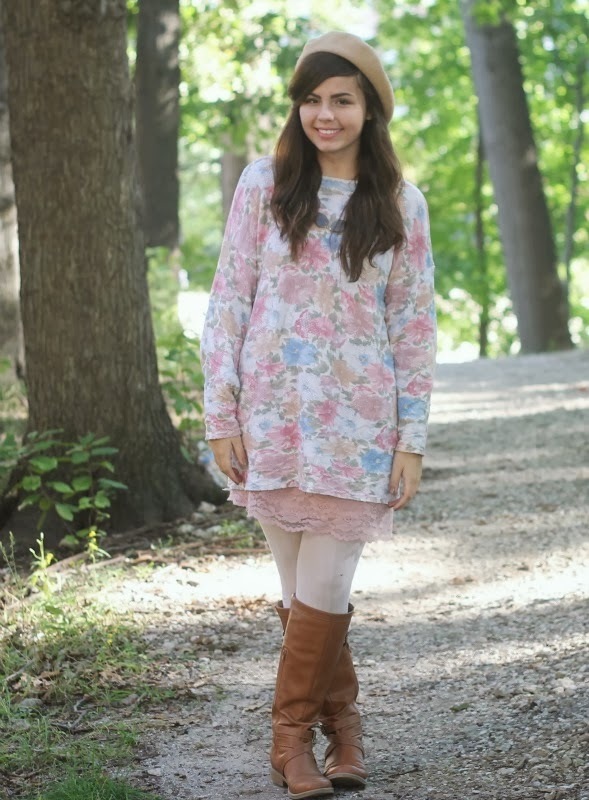 Love the sweater, the coziness and the print! I'm also not that big of a fan of pumpkin spice lattes...never understood what the big deal was. I'm more of a fan of the salted caramel mochas though, amazing! I also have Rebel, it's really dark purple and gothy edgey looking on me because I'm so pale (love it!). When my mom wears it though, it looks like a normal burgundy lol. I love reading all these little details about your life! So sweet! You were right about the MAC 'Please Me', it's gorgeous! I'll definitely consider buying it! Thanks! gorgeous outfit! you are beautiful! You look gorgeous! oh my gosh, that skirt is just so perfect. I really love the lace peeking out from the sweater. Kent Hangs: Scribbles Coffee Shop. Wear Your ♥ On Your Sweater. Iced Coffee with a Side of Roses.